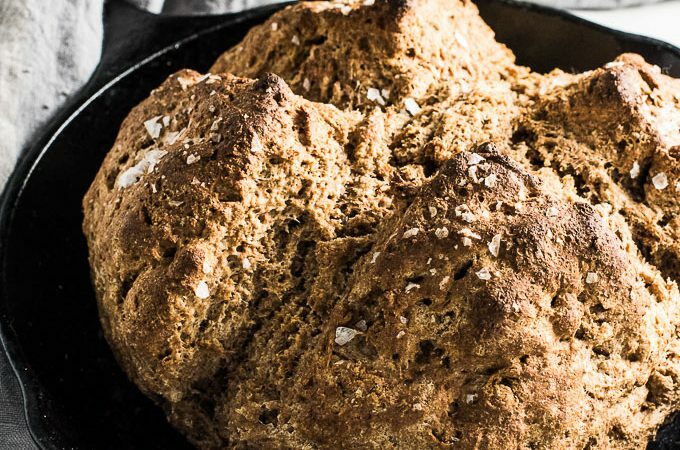 Whole Wheat Irish Soda Bread is a breeze to make and so delicious. If you have 5 minutes to spare you can whip up a batch and sit back while it bakes and fills your house with the smell of fresh baked bread. Preheat your oven to 400 degrees. Grease a 9″ cast iron pan with a little oil. (If you don’t have a cast iron pan, use a casserole dish or baking sheet. In a large bowl, whisk the whole wheat flour, baking soda, and sea salt. Add the butter and use your fingers to mix it into the flour by rubbing the pieces of butter into the flour until the butter pieces are very fine. Make a well in the center and add the buttermilk. Stir with a wooden spoon or spatula and then use your hands to bring the dough together. It will feel sticky and very heavy. Make a ball out of the dough and then press the top down slightly. Using a knife, score the top with an X 1″ deep then place the dough in the oiled pan. Top with a generous pinch of flaky sea salt. Bake in the oven for 45-55 minutes, or until the loaf sounds hollow when you knock on the bottom of it. If you have an instant-read thermometer, the internal temperature should be 200 degrees Fahrenheit. Let the soda bread cool for 10 minutes before slathering it in butter and digging in. This bread is best eaten the same day it is made. Warm it in the oven if you eat it a day or two later.